Whether you're traveling to Columbus, Ohio for business or pleasure, short or long term, our 120 smartly designed and smoke free Studio, One Bedroom and Two Bedroom suites with deluxe kitchenettes provide space to work, live and relax. 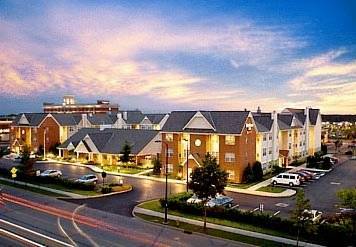 When staying at the Residence Inn by Marriott at Easton, you are staying onsite at one of the finest shopping and entertainment centers in the Midwest. With more than 100 shops and the finest restaurants and entertainment Columbus has to offer immediately outside our front door, you will have no need to worry about driving, parking, or taking a shuttle! All you have to do is check-in and enjoy your stroll through Easton! Amenities such as complimentary high speed Internet, flat screen TV's and complimentary hot breakfast buffet make this hotel an ideal choice for visitors to the Columbus Easton area. We also feature a heated outdoor pool, whirlpool and workout facility with Life Fitness equipment. A weird field of 109 six-foot-tall tall ears of concrete corn, in a suburb of Columbus. The large, Sphinx-like head of Chief Leatherlips emerges from a hill in a public park. Custom-built in 1997 for Longaberger Co., office building sold to developer Dec. 2017. No matter how menial your tasks or incompetent your management, work won't seem that bad inside a seven-story-tall basket.